The Book Chook: Let's Celebrate Digital Learning Day! 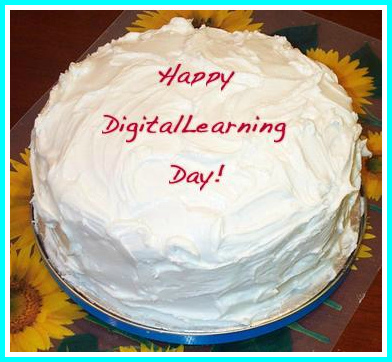 Let's Celebrate Digital Learning Day! Digital Learning Day is February 6 in the USA. (Thank you @CHRasco for letting me know!) I'm adopting it as a special day here at The Book Chook too, because digital learning is so worthy of celebration. From the Digital Learning Day website: "Join the wave of education champions who seek to engage students, celebrate and empower teachers, and create a healthy learning environment, personalized for every child." Definitely worth celebrating, wouldn't you say? Here's a link to a fun downloadable poster created by Peter H. Reynolds for Digital Learning Day that would look great on your library walls. The Digital Learning Day website has some useful articles and links. I liked the list of digital learning tools, and enjoyed taking a peek inside schools to see how digital learning is incorporated into classrooms in the USA. While the video contest is for US schools only, I believe today is a perfect time for us all to look at ways to have digital fun while learning with kids. First of all, digital learning doesn't need to be about using the latest you-beaut gadget with kids. Many families and schools have tools like digital cameras, calculators and computers. These devices give us access to lots of great opportunities for digital learning. When you think about it, digital tools can also include digital scales and clocks. Incorporating these into play time and incidental learning times is helpful for kids. Make a guessing game of having kids estimate then check how much something weighs or how much time has gone by. Of course, tablets and smart phones can make learning fun too! I discussed two educational apps for iPad that encourage creativity last month, Night Zoo Keeper Drawing Torch and Strip Designer. I'll be bringing you more over the coming months. Some websites offer tremendous opportunities for digital learning and fun. Visiting such sites with your kids gives you the chance to share learning AND to supervise what they see and do online, definitely a win/win. Let's look at a couple of websites from hundreds where you and your kids can enjoy creating and learning online. You'll find many more by looking through The Book Chook blog's archives or searching via the buttons at right: Learning, Reading, Writing etc. Kerpoof: This Disney site is truly great for kids. 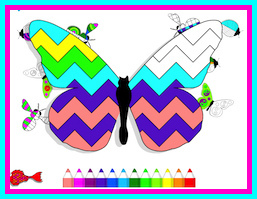 It encourages them to create in so many ways - movies, stories, pictures, cards. Read more about it in Write Stories and More at Kerpoof. National Geographic Atlas Puzzles: Kids can have fun solving a jigsaw puzzle while learning about maps. Read more in National Geographic Atlas Puzzles. Spell with Flickr: Use images from Flickr to spell out words. Read more in Fun with Words - Spell with Flickr. Poisson Rouge: Such a lot of creative fun for pre-school kids! Play matching games, sing along with a choir, play concentration. When your youngsters are asking for screen time, make the most of their limited time by sharing creative sites like this with them. Read more about it in Create with Fish - Poisson Rouge. ThingLink: ThingLink is a new way to present information. You simply upload an image and then embed links, videos etc. Viewers scroll a mouse over the tiny embedded dots to see/read them and click to link. Look for my post about ThingLink on February 15. 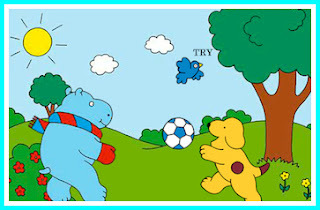 Fun with Spot: This is a cute website to visit after you've read a Spot book with your kids. My favourite page is the story creator, where kids get to make their own Spot story. Read more about it in Fun with Spot. Playing with words and images is another wonderful way for kids to develop visual literacy skills. Some image editors encourage kids to add text to photos, and some have speech bubbles too, so kids can make cartoons. One I've been using a lot lately is Ribbet. Another two I like and wrote about are mentioned in: Play with Words and Images at Pizap and Tuxpi - 42 Photo Effects and Picture Frames. If your kids would like to experiment with generating signs, steer them to RedKid, another family-friendly site, this time with lots of image related avatars and signs. 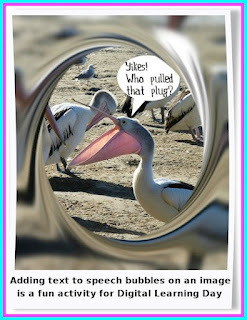 You'll find more ideas in Book Chook Favourites - Playing with Words and Pictures and Use Images to Start Kids Thinking. Comic editors are a lot of fun and give the whole family a chance to create in a digital way. One family friendly and easy-to-use editor is MakeBeliefsComix. Another I like is ToonDoo. Find out more about comic editors in my new PDF, Using Comic Editors with Kids. Today would make an excellent time to start a family project that you record digitally. If you have a video camera, you could use that. Discuss the project with your kids and form a plan of action. Say your idea is to preserve some family memories. Kids could shoot footage at family get-togethers and then use movie software to edit it. You might decide to set up interviews with family members, so kids will need to think of what information they want to gather and what questions to ask. No video camera? No problem. Digital cameras can take still pics of family members and their lives. Brainstorm with kids the sorts of things you want to photograph. Maybe each family member could set up a photo of themselves doing their favourite activity, another holding a favourite toy, a third with a loved book in their favourite special reading place. If you "stitch" those photos together into a slideshow or presentation, you could also add text via separate slides or captions. Once you have your images, try PhotoPeach where you can also add music to your slideshow. No time? Create a time capsule with your kids or students. Find a container and each child adds something small that represents him/her, as well as a printed digital photo and a word-processed and printed About Me text description. Edutopia has many articles about digital learning in Digital Learning Day: Resource Roundup.